It was Holy Thursday and we were remembering Jesus’ last supper with his disciples. For a number of years we have done this with a dinner that includes Holy Communion. We also read the story of Jesus washing his disciples’ feet and then we wash and dry each other’s hands as a sign of honoring service to others. Afterwards, we go upstairs into our sanctuary for the stripping of the altar. Each year, we hang flyers about our Holy Week services outside the church. There is a brief description of each day and Thursday’s mentioned dinner. It’s a potluck so you never know exactly how much food is coming and what it will be, but usually everything works out. It was working out again, although, truth be told, there was not going to be much in the way of leftovers and one person who was bringing chicken didn’t show. Then, about halfway through the meal, several dozen homeless men and women came to the door. They had responded to the magic word on the flyers. Dinner. Oh. If this were Passover, Elijah had actually shown up and we had to scramble to find him a place to sit and food to eat. And I’m proud to say that we did. A few people emptied their plates…onto someone else’s plate. And the person who came late with the chicken was miraculously right on time. I had to somewhat awkwardly explain that, of course, everyone was welcome but, just so we all knew, this was not actually a community meal like we have on Thanksgiving. It was a worship service. Of course, all were welcome to the worship service, which was also a dinner. Which was confusing to people who were just hungry and who had come to community meals in this same space. And isn’t Holy Communion a community meal too? Then it was time for the hand washing, which of course, is symbolic. No one is actually washing. We pour out water and dry each other’s hands. We don’t even use soap. It turned out that people who were really hungry also really wanted to wash. One woman came forward and splashed water on her face while the person before her, lifted the towel and gently dried. For her it was not symbolic, she was washing. 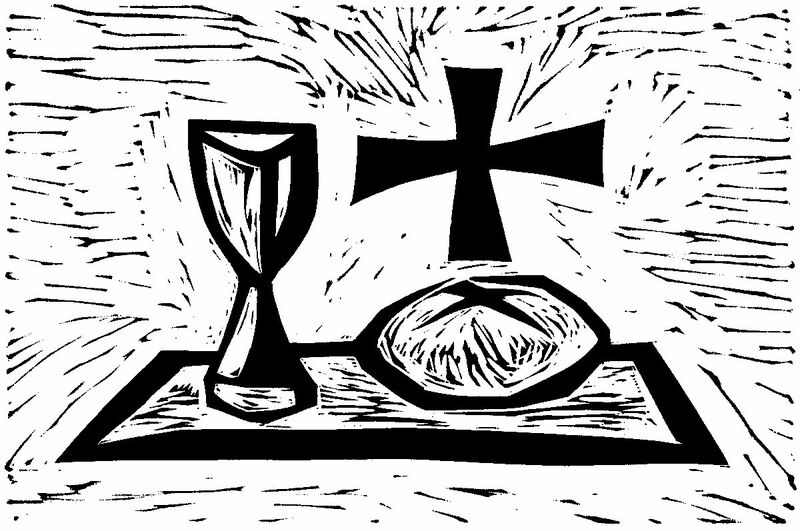 We Lutherans say that Holy Communion is not a mere symbol. We say that Jesus is really present in flesh and blood, even if it looks like bread and wine. And so it was. Jesus really present, even if he looked like a hungry man eating chicken and a hungry woman washing the grime from her face.